As sweet as cinnamon: I am square mad! but this last weekend I decided to get them all done. All 20 of them...I only need to trim 10 of them to square. and just love the freshness of the fabrics with white background. A crocheted Granny Square rug or LaLa as my girls call it. a bed runner to match my quilt. Just need to get to a wool bank and buy some wool matching my Fig fabrics. I might even look online at the Woolen Mills here in Aus. Anyone know a great place to buy wool? and maybe make one if you want as well. Gorgous blocks, will look lovely when set together, such nice fabric. Sorry not a knitter, would know where to start looking! I love the blocks!!! Is Granny Square the name of the pattern? I've seen something similar called chimney sweep. I'll have to look for it. Your blocks look great. I cut up my jelly roll and made one block but it was not square when I finished. Must make another and hope it's right. Have you seen this new quilt along yet that just started today? Here is the announcement I saw first and there is a link to the tutorial from this one. Super grannies! somehow appropriate when I look at your last post! Have you seen the "Great Granny Quilt Along"? Jodi @ Pleasant Home is hosting it with "Bee in my Bonnet". Link is if you're keen to do even more, lol: http://www.pleasant-home.com/2012/07/great-granny-along.html They are adding an extra 'ring' of colour, taking the squares to 12.5in, with four differing fabrics, surrounded by the white. very nice,have a good day from Tenerife!!!!!!!!!! Sickness! !Hope all get better soon. 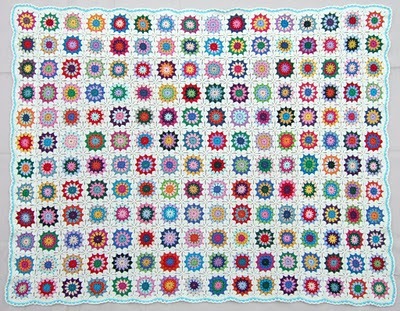 Love the colors in the granny squares!.Love the girls quilts. Enjoy your time.! !